My great grandmother was born on the Cherokee Reservation in North Carolina, so most anything to do with Native American culture captures my attention. The Native Lands: Indians and Georgia exhibition at the Atlanta History Center certainly did. 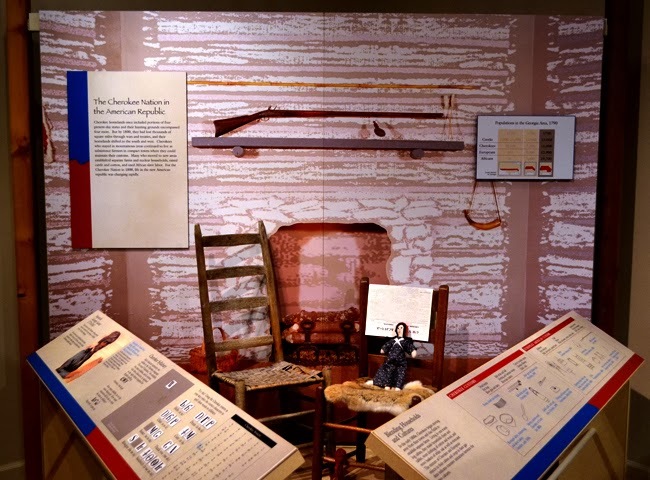 Unfortunately, this exhibition has just closed, but I wanted to give it a shout out in appreciation to the Atlanta History Center for bringing it in. And, I hope everyone will check out the next exhibition to occupy the same space (the gallery across the hall from the Bobby Jones exhibit). 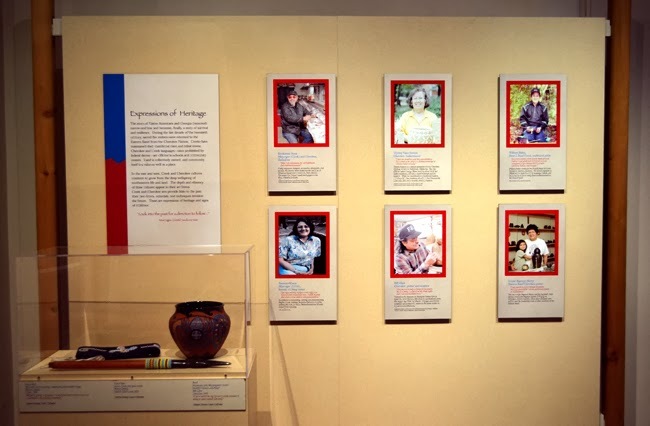 Native Lands: Indians and Georgia, a traveling exhibit, "celebrates the state's original inhabitants beginning with the Mississippian peoples continuing with their descendants, the Creeks and the Cherokees." This exhibition delivered everything it claimed. 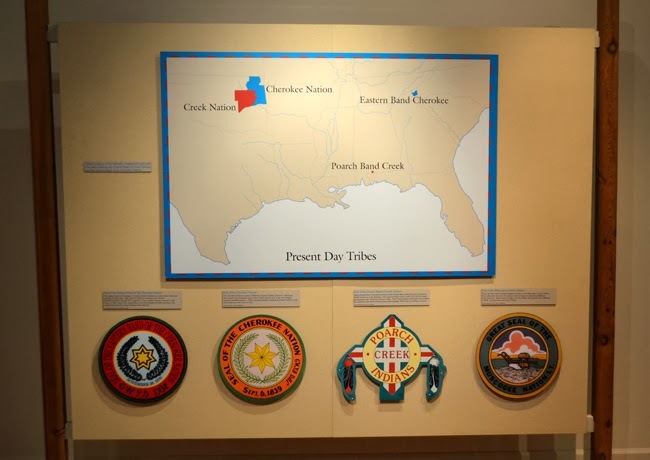 One of the things that I really liked about this exhibition is that it didn't stop at the Trail of Tears...it continued on to discuss Indians' connection to Georgia today. The only thing that I missed was an ample display of actual artifacts. There were a few, but mostly they were reproductions. The important thing though is that visitors learned a lot about Indian culture in Georgia. Again, color me grateful. Oh, and one of my favorite parts of the exhibition was a station that teaches visitors some Cherokee vocabulary. That was fun! I'd never thought about it, but learned in this exhibition that—prior to colonization—no individual could sell or give land away...no individual could own land. 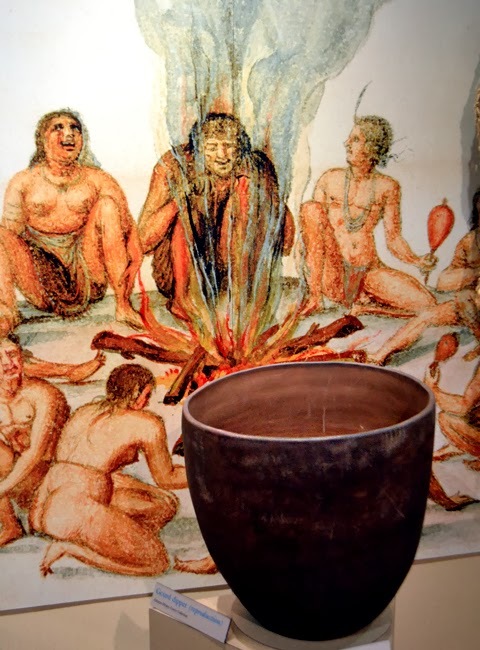 Indians' concept of land was considerably different from the European settlers. An emotional challenge to read through, the exhibition noted in a decent amount of detail, the process of removal—and use of "camps". The number of Native Americans lost to relocation and removal is staggering, and heartbreaking! If you're studying or are an enthusiast of political science, you'd find the markers showing the influence by various politicians of the day—both for and against relocation—of great interest. There are some surprises there, I think. 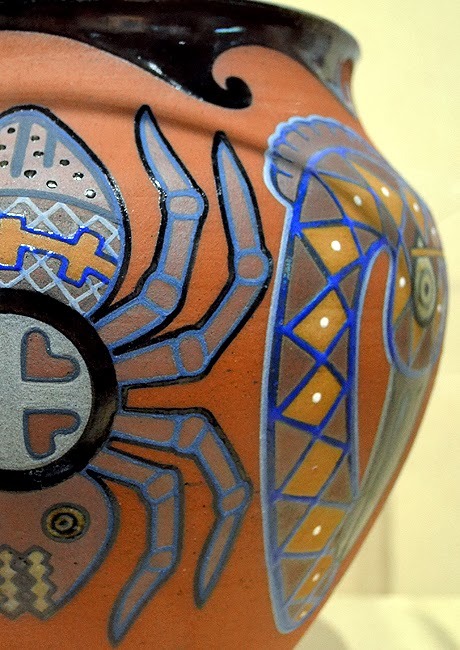 On the flip side of that coin, the exhibition brings to light some of the contributions Native Americans made to modern day society...and there are more than most think. And it shows the European influence in Indian culture, as well. 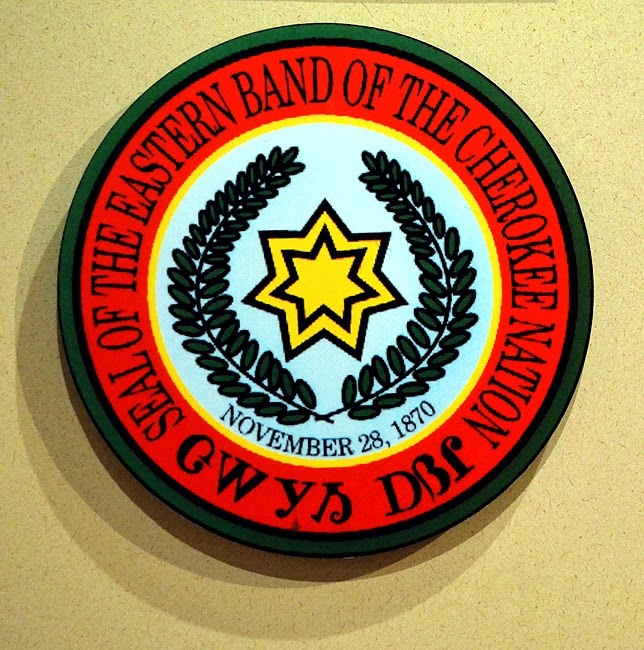 I told you that my great grandmother was born on the Cherokee Reservation in North Carolina. My more than half Cherokee grand mother—who passed a number of years ago at 83...I miss her so—was a mere 4'9" and I loved spending time with her. My other grandmother and one grandfather had a considerable amount of Cherokee, so I have a lot of Cherokee in me, even though what you see is the English/Irish from my father's side of the family. You would never know that my mother is my mother. She has dark hair, a dark complexion, brown eyes, amazing cheek bones...and she did some modeling when she was young (said her proud son). Sadly, there's been more than once when someone said something off color about Native Americans, not knowing my heritage, to which I made it very clear that such comments are totally unacceptable. Be careful what you say...you just never know! This exhibition, like most exhibitions at the Atlanta History Center, was included in regular admission...and free for members! The next listed upcoming exhibition is titled Following the the Bartrams' Footsteps, an exhibition that promises to excite and fascinate!